While Kenner was the primary company that manufactured Star Wars toys in their heyday in the 1980s, there were also a number of regional companies that had the Star Wars license and put out their own versions of the toys. In Mexico, there were quite a few unlicensed bootleg figures available, but there were also licensed toys being manufactured at the time by a company called Lili Ledy. They were basically the same as what Kenner put out, but the packaging and in some cases the materials used in the figures themselves were different, making them attractive to many Star Wars collectors. Some of the Ledy figures can be very valuable — especially mint in the package. Mine can’t exactly be called “mint” but packages for the Ledy Jabba playset are hard to find in any condition. 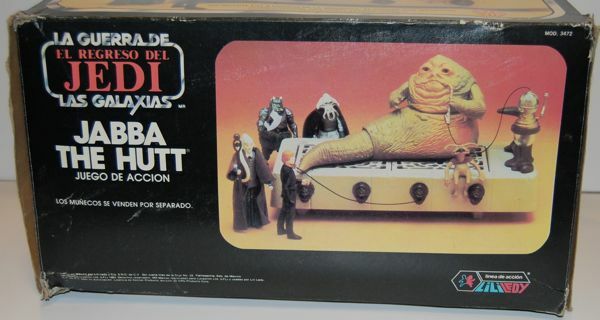 The Lili Ledy version of the Jabba the Hutt Action Playset is an interesting case for a couple of reasons. The most obvious is the box art. Aside from the obvious differences (like it being entirely in Spanish), it also uses a completely different photo of the toy than the one used on the American version. Compare the Ledy version above with the Kenner version below and you’ll see what I mean. The figures are in different positions, and I’ve also read that they are actually different versions of the figures themselves, although I don’t think I could tell that at a glance. But to me the most interesting part is that the photo isn’t even centered on the front of the package — you can see that it’s way off to the right side for some reason. Some have speculated that these differences were the result of an error on Lili Ledy’s part where they used the wrong photo sent to them by Kenner (and then apparently compounded it by not having it centered). Whatever the story, it makes this version pretty unusual. 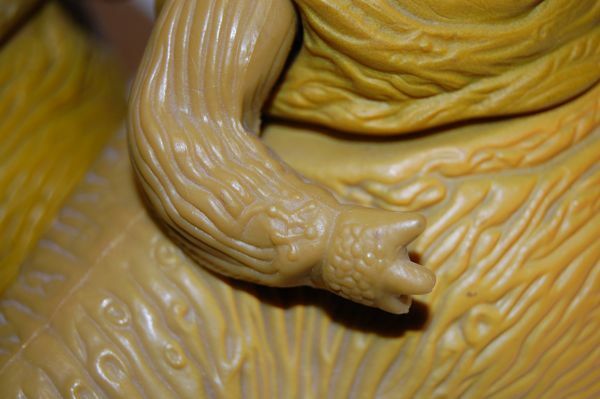 The Jabba toy itself looks a lot like the Kenner version. Most Star Wars figure variations tend to be a bit on the “microscopic” side, but there are a couple of big differences you could probably notice if you had both versions in hand. The biggest one to me is that the Ledy head is cast in a different kind of plastic than the Kenner version. It’s a bit different in color and it’s much softer. You can easily squash it out of shape, while the Kenner version barely yields at all. The other main difference is the arms. On the Ledy version they are cast in a harder plastic that actually seems to make the details significantly sharper than on the Kenner version. They’re also a different color. I’m not sure if there are other differences, because there’s quite a bit of variance even between different Kenner Jabbas, and in the nearly 30 years since they have been made, some have deteriorated while others have not, making it difficult to tell what is legitimately a variant and what is just plastic or paint breaking down. 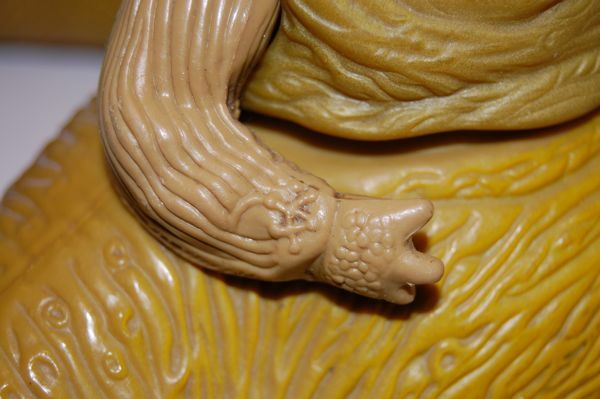 From what I can tell, the Salacious Crumb figure and the throne are more or less the same, although there are two little “dots” on the railing of the Ledy version of the throne that don’t seem to be present on the Kenner version. I’ve seen these on other people’s Ledy thrones, so I think it’s a consistent difference. In any case, I was quite happy to finally be able to track one of these down with the box, as they are not easy to find. I’m getting close to my goal of having every version of the Jabba playset. 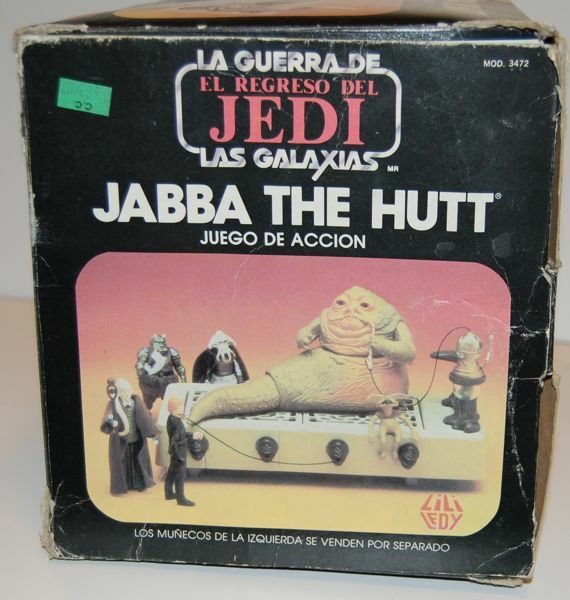 As a side note, this is known in Spanish as the “Jabba the Hutt Juego de Accion” — I find it interesting that in the 80s they just said “Jabba the Hutt” instead of “Jabba el Hutt” as they apparently do today.